Gregory Lasserre & Anais met den Ancxt from Scenocosme play in live with a specific interface for visual and sound performance : Aleas. Aleas interface reveals visual and sound performances to spectators. During interventions, the sound takes shape in the circular space of projection. Here the musical intervention is also an invitation to contemplation. Myriads of visual and sound shape are accumulating in hypnotic superpositions of sounds. This performance was born following during experimentations inside the immersive installation SphèrAléas. 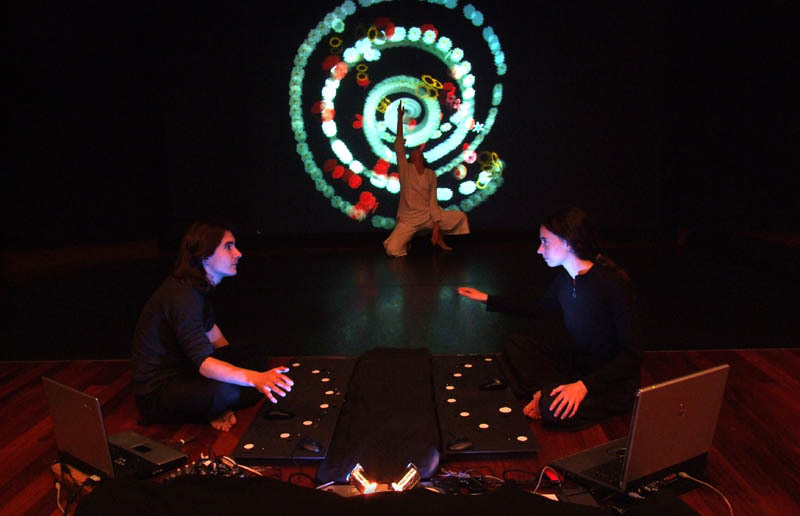 A specific scenography and device was created for Aleas : original virtual music software/instrument. Thus, by placing new materials, users create sustained melodies made of rhythmic relationships animated by subtle temporal intervals. The performers appropriate the system as they create particular processes of repetitive poliphony where parts overlap then disappear into hypnotic swirls. They determine the future of the artwork by experimenting infinite orchestrations. They control easily the melody thus generated: a direct relation between man, image and music. Aleas interface reveals visual and sound performances to spectators. They see and hear on live various handling of the duet. Indeed, during interventions, the sound takes shape in the circular space of projection. Here the musical intervention is also an invitation to contemplation. Myriads of visual and sound shape are accumulating in hypnotic superpositions of sounds. Each performance offers a new dialogue or visible duel. In the opposite of the standard veejaying and deejaying performances, the spectator follows exactly the musical and visual evolution as well as the performers. Here, everything is revealed and linked. The duel reveals moments of complicity, doubts, errors, chaos... but which constitute the origin of creation of these micros-universes. Each performance offers a multitude of possibles made by minimalist elements. The musical dialogue gives life to sound creations in suspension. In connivance with repetitive music, the duo plays with unstable and reactive sounds. Scenocosme tries to immerse spectators in body experiment into a sound space favourable for daydream.